The alpine village of Samoëns is just an easy 1-hour drive from Geneva international airport but if feels as if it is 100’s of miles away from the real world - it really is like living in a bubble. Many people assume that the Alps are just for winter activities but my believe is that spring in Samoëns is just as great as the winter in Samoëns. As the days get longer and sunnier, the valley begins to come alive, the snow disappears, the grass turns green and the spring meadows start to bloom. The Giffre Valley boasts an extensive national park overflowing with activities as well as a heritage dating back to medieval times. It really is a genuine alpine playground with so much to do but here are our top 5 spring favourites. Often the ski lifts don’t open until late June, but it is still possible to head out and tackle a great variety of cross country tracks suitable for all levels from beginners to experts. Mountain Spirit opened in summer 2017 are your one-stop shop for everything. They offer guided mountain bike and electric bike trips as well as hiring all the equipment required. When the ski lifts aren’t operating they offer a lift service to the top of the mountain. One of our favourite routes is from Samoëns to Sixt Fer a Cheval and is suitable for all levels. Start this bike ride by following the River Giffre out of Samoens towards the end of the valley. When you reach the bridge at Le Perret, cross the river and head through a field when you will arrive at the spectacular Gorge des Tines. After the gorge descend into the authentic village of Sixt Fer a Cheval. Stop and enjoy a drink and take in the views. After you can either head back or carry on and head up to the magnificent Cirque Fer a Cheval where even more spectacular views await. As the snow melts the water level in the river rises making it excellent conditions for rafting. It’s a great way to spend a couple of hours and see the valley from an alternative view whilst enjoying a few thrills and maybe even some spills. 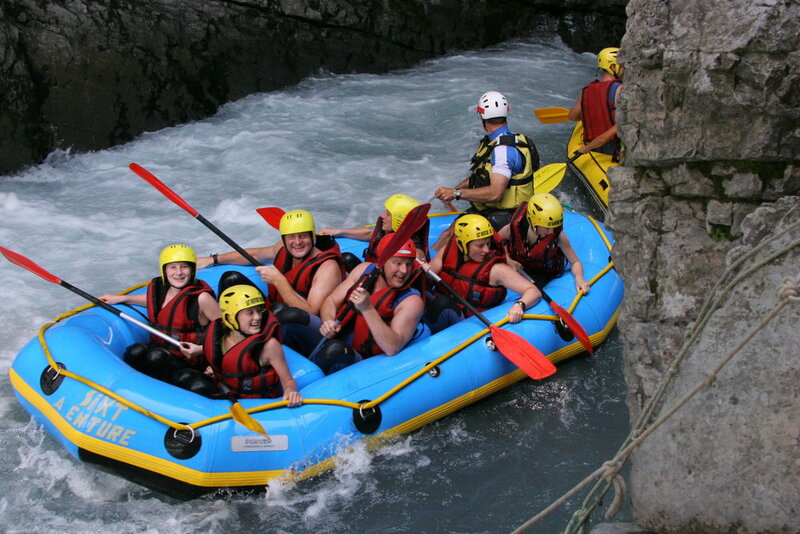 Ecolorado Rafting are one of the larger operators in Samoëns so tend to operate outside the main summer holiday periods. They provide all the equipment and drive you to Sixt where the paddling starts. Before heading off you are briefed on how to stay safe and then it’s off, full steam ahead. You will find yourself alternating between laughing, screaming and shouting as you ride the waves, bounce off a few rocks, swim and splash each other during various calmer stretches. It really is a fun few hours. Our friend, David Roi, who runs Les Tontons Volants introduced us to Paragliding (Parapent) in 2006 when we first arrived in the village. 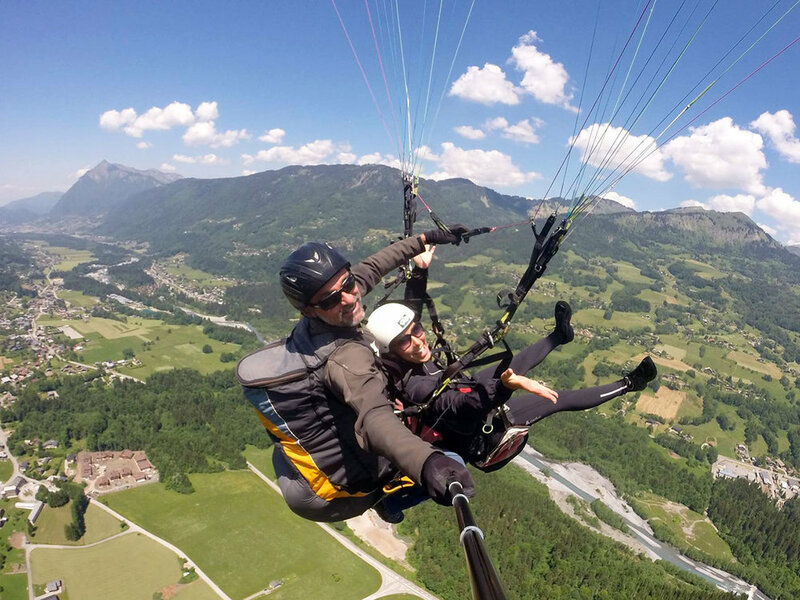 Samoëns is ideal for paragliding and by booking a tandem flight you can discover the pure joy of flying like a bird with views that will take your breath away. Depending on the conditions, take-off is a few simple steps or sometimes it might be necessary to run a couple of metres! If you fancy an extra thrill your pilot will happily perform a few aerobatic tricks before landing back in Samoëns . The Giffre valley and surroundings are a walkers' paradise catering for all abilities from gentle walkers to serious hikers. All the trails are well signposted and with 900km of marked trails up to an altitude of 3100 M you really are spoiled for choice. It’s always worth checking the forecast before setting off as the mountains can be very changeable, expect all weathers! If you fancy a longer adventure there are some great mountain refuges that provide lunches and overnight accommodation. The Tourist Office in Samoëns can provide all the information you need such as routes, maps, opening times and booking information. It’s also possible to hire a local guide who will inform you about the local wildlife and fauna as well as showing you the route. Some of our favourite walks are following the river from Samoëns to Morillon or driving up the Col de Joux Plane and following the track around the mountain to the peak of the Bourgeoise, the views are stunning on a clear day. The Cirque du Fer a Cheval offers a multitude of walks with breath-taking scenery, expect huge cliffs, rugged mountains, jagged peaks and waterfalls everywhere you look. During the spring months it’s not uncommon to see and hear avalanches as the snow starts to melt. After all the activity it’s great to return to The Lodge and kick off the shoes, find a comfortable spot on the south facing balcony. Crack open a cold beer or a bottle of chilled wine and take in the view and look over at all the great places you have just been exploring. I always find myself sitting there with a smile as I relive the experiences and fun I have just enjoyed.